The hospital Brad Huerta leads simply didn't have enough money to pay for a traditional electronic health record system. It couldn't afford the software. And it couldn't afford hiring a single information technology employee, not to mention a complete staff. Cloud-based EHRs are becoming more popular, attracting providers with promises of lower prices and higher security. So Huerta, CEO of Lost Rivers Medical Center in Arco, Idaho, decided to put the 14-bed critical-access hospital's records and billing systems in the cloud. There, they'd be overseen and maintained by a software vendor, not by an internal employee that the hospital couldn't afford to pay anyway. More and more, hospitals such as Huerta's are following in the footsteps of physician groups and looking to the metaphorical sky for their EHR needs. 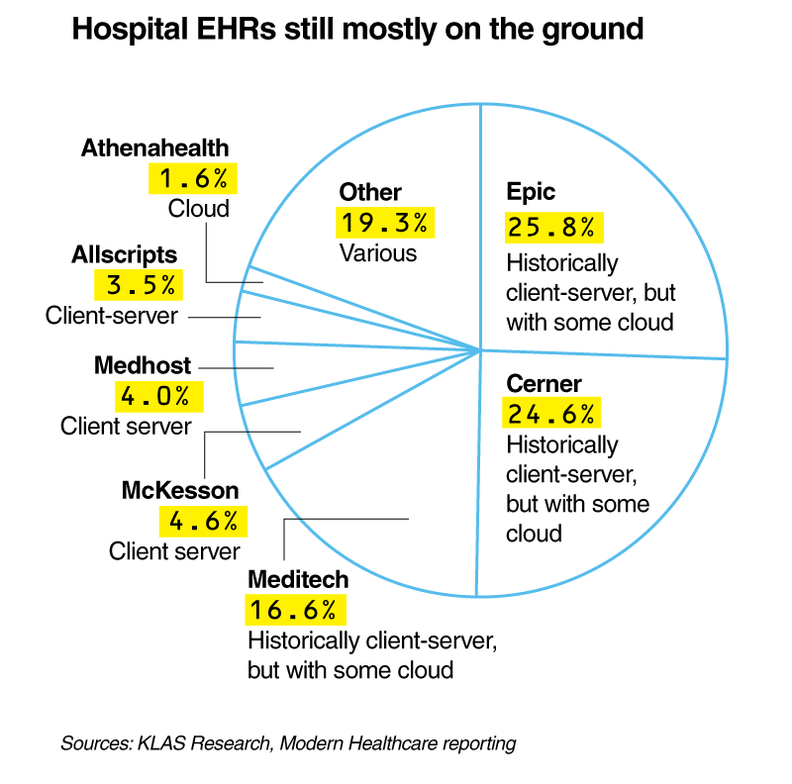 Though Epic Systems Corp. and Cerner Corp. still dominate the hospital market with solutions that are mostly client-server based, cloud-based EHR vendor Athenahealth more than doubled the number of hospitals it has contracts with last year, and 90% of provider organizations surveyed by KLAS Research are either currently hosting or considering hosting their data off-premises, according to preliminary research. 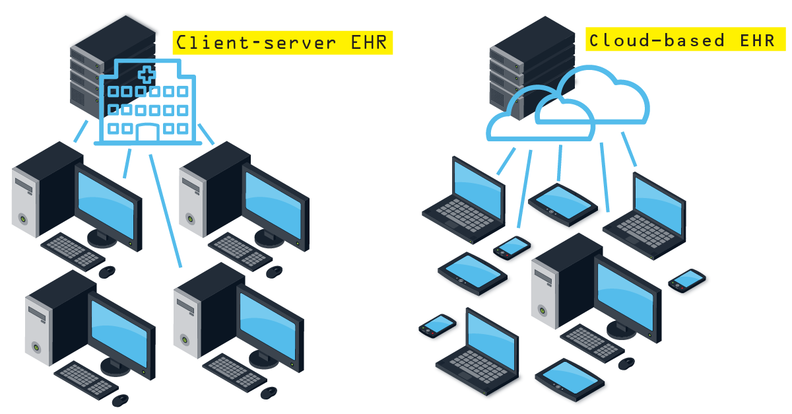 Cloud-based EHR vendors say their solutions are cheaper upfront, faster to deploy, and safer than their counterparts that are hosted in-house. That's because of where the EHRs reside: in the cloud—which means on servers somewhere else, rather than on servers inside the hospital or doctor's office. In other words, cloud-based EHRs are web-based. The difference isn't just technological—it's financial too. Whereas traditional EHRs tend to include heavy installation costs, cloud-based EHRs sometimes have no such outlays, with vendors charging monthly fees or a portion of providers' collections. The move toward cloud-based EHRs signals a time is coming when server rooms in hospitals will be rare and when all providers can access their patients' information on any device, not just on a computer in the exam room. It signals a time when it's not magical that an EHR installation takes just a few months—it's expected. When Huerta first started looking into the cloud, it was because he wanted to bring the hospital's medical records into the 21st century from 1993, the year its EHR was first installed. Lost Rivers' revenue cycle was molasses-slow—as was the technology itself, which depended on the copper wires the hospital still used for telecommunications. Now, everything is integrated into Athenahealth's platforms, from billing to the clinic to the emergency room, helping to stabilize the hospital's once-dire financial situation. Lost Rivers is charged by Athenahealth based on the amount of collections. “It allows you to focus more on your healthcare IT needs and less on your data-center management needs,” Parent said. Users of cloud-based EHRs don't need to hire as large an IT staff (though it's still crucial, of course, for employees to use the web safely and intelligently). “One of the advantages is that you can really leverage the best-of-breed security practices that are out there,” said Josh Siegel, chief technology officer of CareCloud, which makes apps for practice management, EHRs and patient management on its cloud platform. “Practices that normally wouldn't be able to afford that level of rigor can take advantage of work that's been done already.” That work can include data encryption, regular audits and dedicated security staff to monitor system activity. Updating can be easier with the cloud too. “With any cloud-based system, because they're pushing it out to the entire cloud, they have to test it really well, so you don't expect any major hiccups after the update,” said Dr. Michael Arcaro, medical director of clinical informatics at Capital Health in New Jersey, which uses Athenahealth on the ambulatory side. “Technology and policy are changing so fast in healthcare,” Fabozzi said. “The cloud offers the advantage of constant updates. It's much easier to respond to the IT implications of those regulatory issues,” she said, citing how quick upgrades can be because they're pushed from the cloud. Athenahealth says it can push updates in response to a client's workflow patterns. Not everyone is sold on cloud EHRs. One concern is security. There's also the unknown of what kind of return on investment a cloud-based EHR will provide a health system in the long run. And there's convention. “It's a mixed bag no matter which way you go,” Martz said. Still, there's no solution that's completely secure, and if a vendor is attacked, many health systems could be affected at the same time. Another concern is cost. “Leaving an on-premises solution and moving to a cloud-based solution is a little bit of an unknown in terms of ROI,” Fabozzi said. “Going to the cloud is not necessarily cost-saving in the long run. It depends on what the vendor's business model is and the features and functions, because there's always something more they can charge for,” she added. Though updates pushed from the cloud are less of a hassle than client-server updates, because they're pushed to many users at the same time, some of those users might not be ready. “If it changes workflows and you weren't expecting workflows to change, that is hugely disruptive,” Muntz said. Workflows are somewhat limited by the cloud vendors, who don't allow as much customization as their client-server counterparts. “You have a little less control over your builds and sometimes a little less control of your backups and processes,” Parent said. For small hospitals, there's another hurdle too: infrastructure. The cloud itself demands a strong and fast internet connection. “If you don't have a good internet connection, you don't have a choice,” Navani said. For rural hospitals such as Lost Rivers, getting a good connection can be challenging. First and foremost, Lost Rivers had to upgrade its telecommunications wiring to support the amount of data and speed necessary to run a web-based EHR. “We're lucky we even have a color TV,” Huerta said of his hospital's technology before the improvement, which included upgrading to fiber. Though that challenge wasn't the same as that of installing a client-server EHR, it was still tough.